This is Madame Bollinger’s ultimate gift, the result of rare conditions: a blend between a great champagne and one of the very best red wines of the Champagne region, both from the same vintage. Salmon coloured with orange hues. To the nose, aromas of fresh bread, gingerbread and cinnamon with woody and floral notes. In the mouth range blossom and citrus zest with gentle notes of redcurrant. La Grande Année Rosé 2005 enhances and complements perfectly the subtlest gourmet experiences. This powerful and complex champagne is perfect for a romantic dinner, adding a touch of infinite seduction. To fully appreciate its unique style, bouquet and aromas, La Grande Année Rosé 2005 is best served between 8 and 10°C. You can enjoy La Grande Année Rosé 2005 right away, or choose to age it in your cellar. Madame Bollinger agreed to a Bollinger rosé under one condition, it had to be extraordinary, and that is how La Grande Année Rosé was born: the unique blend between a great vintage champagne and a red wine from a unique plot, the legendary Côte aux Enfants. 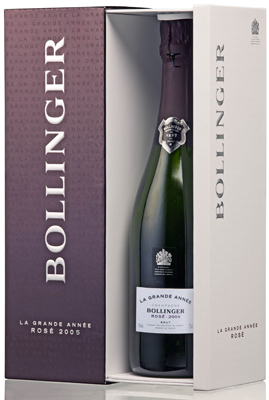 To produce a red wine of such high quality in the champagne region is a challenge: a rare treat, a true Bollinger. At Bollinger, only very high quality harvests become vintage: 2005 revealed a restrained and elegant champagne with a notable presence of floral aromas. Dosage: moderate, 7 grams per liter. Blend of the 2005 vintage: 72% Pinot Noir, 28% Chardonnay. 13 crus: 95% Grands Crus, 5% Premiers Crus. 5% red Côte aux Enfants wine. La Grande Annee Rose is an extension of the Grande Annee by the addition, at blending, of a red wine from one of the House’s emblematic vineyards, La Cote Aux Enfants, located in the village of Ay. This plot of Grand Cru, measuring less than one hectare, is only used for red when the grapes are perfectly ripe. Made exclusively of Grand Crus and Premier Crus from Champagne, the grapes selected are from the cuvee to keep nothing but the best juice. 13 crus make up the composition of the Grand Annee Rose, of which 95% are Grand Crus and 5% are Premier Crus. The first fermentation is done in small oak casks, lot by lot, cru by cru, grape variety by grape variety. This allows Bollinger to use a very strict selection process. Bollinger only uses old casks (5 years old or older) to ensure that neither tannin or oak flavours are imparted to the wines. This method increases both the aromatic complexity and the ageing capacity of such wines. unique in champagne, is a guarantee of freshness and allows the aromas to keep their bouquet and clarity. The intense colour is due to an addition during initial blending of 5% red wine, made with grapes from La Cote Aux Enfants.